I have been straight out at work this week - we have a site visit coming up and we are preparing all of the information the reviewers need to see - so every night I've been coming home mentally exhausted! But tonight when I got home - I wanted to sit in my craft room, relax and make a card! The festive sentiment stocking is from the Rustic Christmas Set and the foliage sprig is from the Scandi Doodle Christmas set - both by Waltzingmouse. 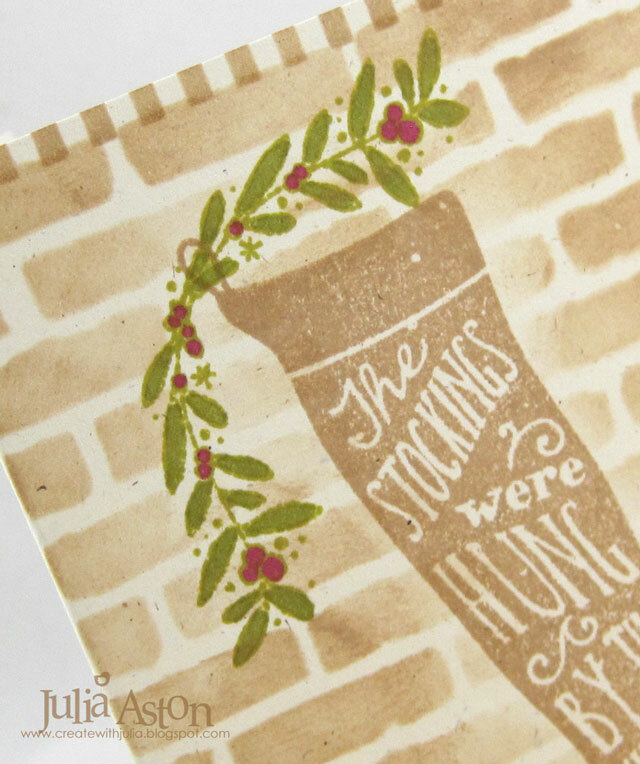 I stamped the stocking in Classic Kraft and the foliage in Simply Chartreuse. 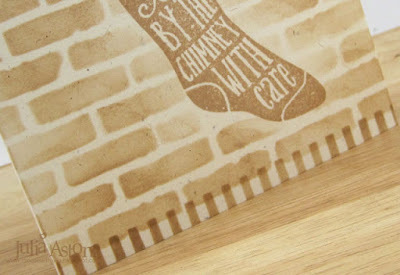 I laid my Wendy Vecchi Basically Bricks stencil over the stampings and sponged around them trying not to go right up to the sides of the stocking. 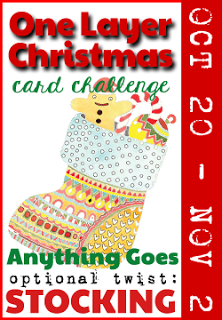 The lightness around the stocking gives the feeling of depth - even though this is a one layer card. I then used a stripes stencil along the top and bottom edges of the card. I colored the stems and berries with Copics. Don't you love the fanciful little dots and stars around the leaves - they are part of the foliage stamps. Ok,- now I'm going to go sit on the couch and relax! Thank goodness tomorrow is Friday! what a pretty card.. i love the brick background..
Lovely one-layer card, Julia. Wonderful job sponging the background. Love the soft colour blending and pretty neutrals. Glad you're finding some crafty time after your stressful work days. Love how combined the stencil and stamped image. Lovely Christmas card. Thanks for sharing at OLCCC.